It was during a Management Team meeting that one of the best ideas I’d ever heard was suggested. Shortly after moving from a movie theater to our 19 acre campus, into a building that was too small from the start, we were discussing our need to increase the auditorium seating capacity of the auditorium (multi-purpose space). At the time, we were able to seat up to 350. Of course we had increased the number of services to the maximum, but we were beginning to see that if we didn’t do something soon, our attendance growth rate would begin to slowdown. Because of the cost of buying the land and developing it to the extent needed for a building, we were only left with around $1 million to build the building itself. And, in order to adequately accommodate the number of children needed per service, the auditorium was only 47’ wide and 70’ deep. Our interior designer had recommended a pretty standard chair, and we purchased the maximum amount we were able to get into the space (including a few more!). The supplier was Bertolini Sanctuary Seating (who I highly recommend, by the way). I contacted Bertolini, and son of a gun; they did manufacture a chair that was 2” narrower than the standard 20” model we had already purchased. 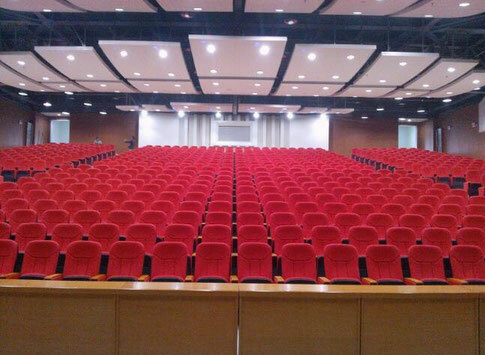 Since we were already working on our second building which would have a seating capacity of 1,000 and we would need more chairs anyway, we worked with Bertolini to purchase the 18” chair with the same fabric as the 20” chairs we already had. When we were done, we had increased our seating capacity from 350 to 430. That might not sound like a lot, but across 4 services it amounted to an increase of 320! I couldn’t believe it … such a simple idea allowed us to continue to grow through the year or more it took to complete our current auditorium that now seats 1,000. All of the chairs (and then some) 18” and 20” are now being used. How did our people react to the narrower chairs? Most didn’t even notice. A few knew something had changed, but they couldn’t quite “put their finger on it.” For the most part, it was a non-issue.